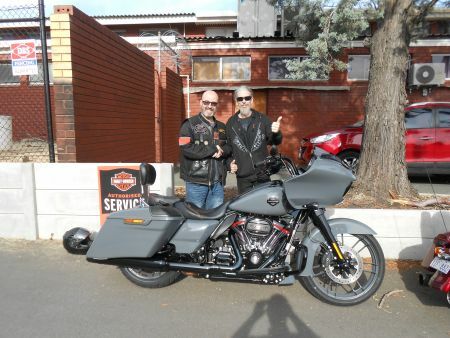 Steve Marshall is the Director of the Swan River Chapter H.O.G and took some time to chat to us about his brand new CVO Road Glide and the experience he had purchasing a CVO from Perth Harley-Davidson. For those of you that don’t know what a CVO is, it’s the Harley-Davidson Custom Vehicle Operation, these bikes are produced in limited numbers world-wide and are in exceptionally high demand. They are packed with upgraded accessories and are truly unique. Steve was lucky enough to get his hands on a new CVO Road Glide in Gunship Grey. This bike stands out in a crowd, the new 21-inch paint matched front wheel, low screen and murdered-out engine, frame and forks make this bike look custom out of the box, but it’s the little details that make it really special. The orange accents on the footboards, grips, derby covers and the heads really pop against the grey and black and you won’t find the CVO badge and CVO seat on another non-CVO bike. The half size crash bars and the fact that Harley have not fitted lowers to the bike make the profile look more menacing and the grey, black and orange dials finish the paint matched inner-fairing perfectly. It’s a beautiful bike with so much subtle attention to detail. Amazing is the short answer. The new M8 engine has got to be ridden to be truly appreciated and the CVO-only 117 version is a step-up again. There is power all through the rev-range and the engines torque makes overtaking fun (and safe). Once you are on the road, all the power you need is there and all through the gears, I found that I could very easily stay in 4th gear for most of a ride if I wanted to. The power is there to overtake when needed but its smooth enough to sit at 100kph as well. When you really accelerate on this bike, it’s amazing how quickly it gets up to high speeds and the bike remains smooth and controlled - which means you can find yourself whizzing along at speeds the police or your wallet would not like, without realising! The big front wheel was a worry to me but it handles very well. When turning, the bike feels responsive and I know where it’s going even when you are going hard. The linked ABS Brakes work well and stop the bike with lots of control. All-in-all, it handles excellently at both high and low speeds and doesn’t ever leave you feeling out of control or unsafe. So when you buy a CVO, you join a group of limited bike owners and Harley works hard to make you feel special. Now if you are like me and have had a few bikes from Perth Harley-Davidson, you know they work hard to make you feel special, even if you aren’t buying a CVO but what you get with a CVO goes that extra mile. From the limited edition CVO jacket, 3 years H.O.G membership or VIP invitation to Sturgis (wish I could go), it’s all designed to make you feel like you have joined a VIP group of owners. All-in-all, this is one of the most complete bikes you can buy from Harley-Davidson, the price tag is high but worth every penny in my opinion. The CVO extras you get and can only get with a CVO add to the exclusive feel of owning a bike and joining a VIP part of a community that is already amazing. You can catch Steve and check out his CVO Road Glide at any of the upcoming Swan River Chapter HOG Rides. For more information about the CVO Road Glide or any other CVO Model, please contact the Sales Team on 08 9458 6754.